Judging by the whoops and cheers at the Model 3 unveiling, Tesla may be on track to usurp Apple as the company with the largest fanfaire for its product releases. Elon Musk, company founder and CEO, took the stage at Tesla's Hawthorne, Calif. design studio and finally revealed the company's highly anticipated, high volume, $35,000 vehicle. "Why do we do this? Why does Tesla exist?" Musk proposed to the crowd. "[Because] it's very important to accelerate the transition to sustainable transport. This is really important ot the futuer of the world." Citing statistics on global warming and the effects of toxic emissions from gas vehicles, Musk seemed most firm in laying out his belief that clean, green vehicles are key component to reversing and adverse effects of climate change. "We began with a secret master plan," Musk told the invite-only crowd, saying that on its inception Tesla asked itself, "How could we as a tiny company with very few reousrces make a difference?" The Tesla Model 3 brings with it plans to vastly expand Tesla's manufacturing and support infrastructure. That answer came in the form of a low volume, high price vehicle -- the Tesla Roadster. Since producing that vehicle Musk said the company has gradually progressed from low volume, high price -- moving from the Roadster, to the Model S, to the Model X, investing the revenue from sales of those vehicles to finally arrive at it's goal of a high volume, low price ($35,000 before any federal tax incentives) vehicle in the Model 3. Acceleration of 0-60mph in less than 6 seconds (base model), with faster options available. An EPA-rated range of 215 miles per charge. Autopilot features, such as AutoSteer, Auto Lane Change, and Emergency Steering will come standard without the need for add-ons. On the design side Musk said the Model 3 can comfortably seat five adults - emphasizing the word "comfortably." All this roominess is achieved because of the lack of a large combustion engine. With more space on the front end Tesla's designers compressed the instrument panel and moved the front seats forward, "You're going to feel like you're sitting more forward, it feels great," Musk told the audience. "The rear roof is one continuous pane of glass ... it gives you amazing headroom and a feeling of openness," Musk said, adding that the Model 3, like the Model S, will also feature front and rear trunks "The car has more cargo capacity than any gas car of the same dimensions." Musk said he was once asked if a seven-foot surfboard could fit into the Model 3. "The answer is, yes." Of course it's one thing to have a car like the Model 3. But it's another to create the infrastructure both on the production end and in terms of charging and vehicle maintenance, to support the car. Perhaps anticipating doubts in this regard Musk outlined a blueprint for the coming years. By the end of 2017 Tesla aims to: Double the number of superchargers and quadruple the number of destination chargers worldwide (there are currently 3,600 of each worldwide); and double the number of service locations in North America, Europe, and Asia from 215 to 441. On the manfacturing side, Musk said he's confident that Tesla's vehicle factory in Fremont, Calif. can maintain its current production volume of 500,000 cars per year. And he also spoke of Tesla's highly touted Gigafactory, which he said will be essentially absorbing the world's entire lithium-ion production. The Gigafactory will have the largest footprint of any building (second in volume only to the Boeing factory in Washington state) and will produce more lithium-ion batteries than all the other factories doing so in the world combined. 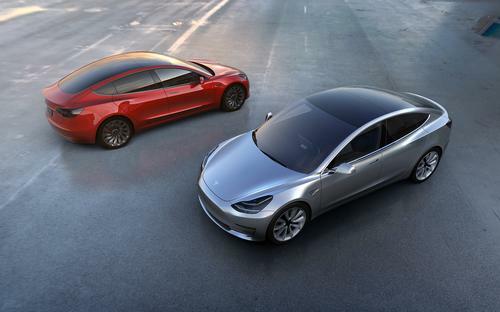 At the time of the event, Tesla said that it had already received 115,000 orders for the Model 3. Deliveries for the vehicles are expected to being at the end of 2017 with current Tesla owners taking priority followed by those who reserved at a physical store, and lastly online reservations.